According to the U.S. Federal Reserve, the Janet Yellen speech will officially detail "inflation dynamics and monetary policy." Yellen's speech comes on the heels of the central bank's decision last week to keep short-term interest rates unchanged. The Fed has left interest rates near zero since the depths of the Great Recession in 2008 and hasn't implemented an interest rate hike since June 2006. The Janet Yellen speech also comes when markets are volatile following the Sept. 16-17 meeting. The S&P 500 is down 2.8% in the last five sessions and was off another 1.1% Thursday morning. Commodities have also tumbled. Copper, long a barometer of economic health thanks to affordability and numerous uses, is down 6% since last Thursday. Oil prices are down 5.6% since the FOMC meeting. Investors worry that the tightening of U.S. monetary policy could slow global growth. However, some economists believe that raising rates would send the message that the U.S. economy is strong enough to handle an interest rate boost. 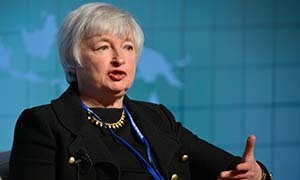 Yellen cited mounting uncertainties abroad, a slowdown in China, and volatile financial markets as reasons for not raising rates. Investors now wonder what factors are most important in the Fed's decision to start moving up borrowing costs. The Janet Yellen speech tonight could provide clarity. The Dow Jones Industrial Average was down more than 250 points (1.6%) in early trading Thursday. The S&P 500 was down 1.4%, while the Nasdaq was also down 1.6%.